August 28, 2017 – Preparation of NASA’s next spacecraft to Mars, InSight, has ramped up this summer, on course for launch next May from Vandenberg Air Force Base in central California — the first interplanetary launch in history from America’s West Coast. 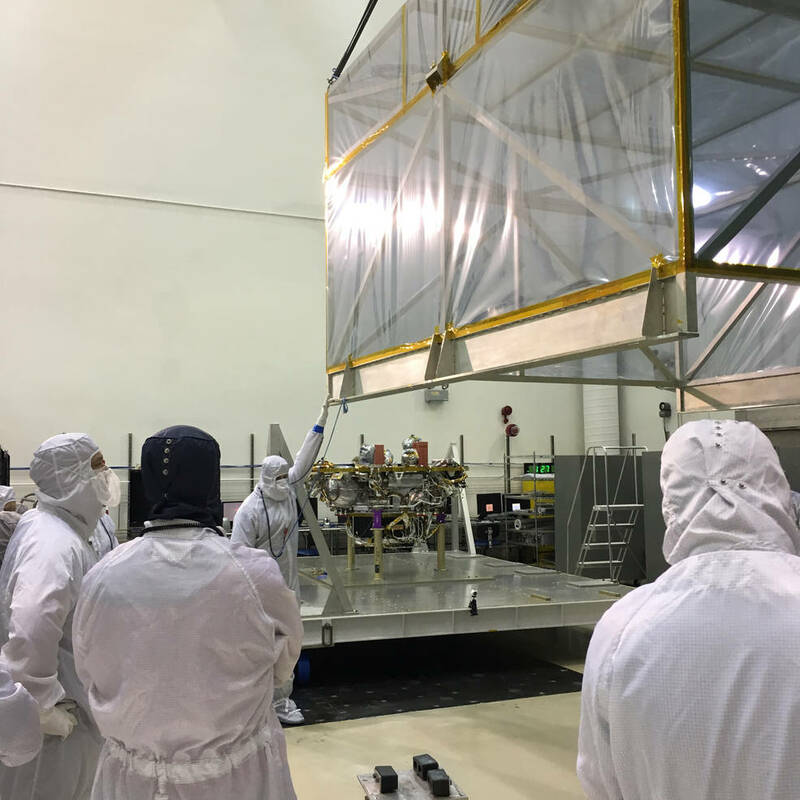 Lockheed Martin Space Systems is assembling and testing the InSight spacecraft in a clean room facility in Littleton, Colorado. “Because the interior of Mars has churned much less than Earth’s in the past three billion years, Mars likely preserves evidence about rocky planets’ infancy better than our home planet does,” said InSight Principal Investigator Bruce Banerdt of NASA’s Jet Propulsion Laboratory, Pasadena, California. He leads the international team that proposed the mission and won NASA selection in a competition with 27 other proposals for missions throughout the solar system. The long form of InSight’s name is Interior Exploration using Seismic Investigations, Geodesy and Heat Transport. A seismometer, supplied by France’s space agency, CNES, with collaboration from the United States, the United Kingdom, Switzerland and Germany. Shielded from wind and with sensitivity fine enough to detect ground movements half the diameter of a hydrogen atom, it will record seismic waves from “marsquakes” or meteor impacts that reveal information about the planet’s interior layers. A heat probe, designed to hammer itself to a depth of 10 feet (3 meters) or more and measure the amount of energy coming from the planet’s deep interior. The heat probe is supplied by the German Aerospace Center, DLR, with the self-hammering mechanism from Poland. A third experiment will use radio transmissions between Mars and Earth to assess perturbations in how Mars rotates on its axis, which are clues about the size of the planet’s core. The spacecraft’s science payload also is on track for next year’s launch. The mission’s launch was originally planned for March 2016, but was called off due to a leak into a metal container designed to maintain near-vacuum conditions around the seismometer’s main sensors. A redesigned vacuum vessel for the instrument has been built and tested, then combined with the instrument’s other components and tested again. 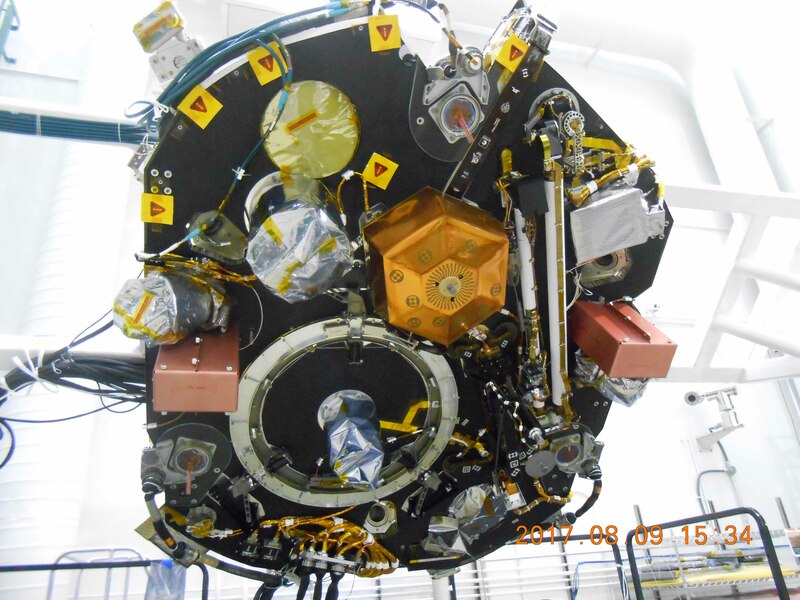 The full seismometer instrument was delivered to the Lockheed Martin spacecraft assembly facility in Colorado in July and has been installed on the lander. The best planetary geometry for launches to Mars occurs during opportunities about 26 months apart and lasting only a few weeks. JPL, a division of Caltech in Pasadena, California, manages the InSight Project for NASA’s Science Mission Directorate, Washington. Lockheed Martin Space Systems, Denver, built the spacecraft. InSight is part of NASA’s Discovery Program, which is managed by NASA’s Marshall Space Flight Center in Huntsville, Alabama. Together with two active NASA Mars rovers, three NASA Mars orbiters and a Mars rover being built for launch in 2020, InSight is part of a legacy of robotic exploration that is helping to lay the groundwork for sending humans to Mars in the 2030s.